If you own and Audi or VW you are probably someone who appreciates quality. These cars have a reputation for excellence and reliability, so it seems counter-intuitive to allow them to be serviced by an ordinary garage. In order to get the most out of your car you should be taking it to a specialist for servicing. What makes VW and Audi so special? Audi’s well known tagline “Vorsprung durch Technik”, which means “Progress through Technology”, sums up their reputation very well. Audi is known for its engineering excellence and technological innovation. Volkswagen AG is the largest shareholder of Audi AG and its cars have a reputation for reliability. Both Volkswagen and Audi are considered quality cars and their component parts are also high quality. VW Audi specialist, A specialist in Volkswagen and Audi servicing will not only use the best quality replacement parts but will also have significant experience when it comes to servicing these cars. The high standard of the servicing will match the excellent quality of the vehicles themselves, ensuring that you get the most out of your car and that it runs as well as it is intended to. 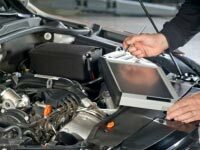 A VW and Audi specialist will also have diagnostic equipment and software, not to mention tools and equipment, best suited to these vehicles. Familiarity and experience with all the various models makes it easier for a specialist to not only diagnose any problems but also to spot any potential issues that may arise and deal with them before they cause trouble or need expensive repairs. VW and Audi specialists are not necessarily main dealers and you can often get a better deal from an independent. Provided they have the necessary expertise and experience, independent specialists will be able to offer all the same benefits as a main dealer but usually at a lower price point, giving you the best of both worlds. As well as all of the above, Clover Autos in Essex also boast friendly, knowledgeable staff, clean and tidy workshop, free collection and delivery of vehicles within a five mile radius whenever possible and up to 40% savings on main dealer labour costs. Find out more about why you should choose us to service your Audi or VW or give us a call today to book your car in.